Custom Mid-Calf or Midi Size Performance Sock - for guaranteed all day comfort and support. Our Performance Socks are Pantone matched and available in three heights - ankle, midi, and calf. With extra spandex in the arch, these socks provide a more snug fit and also feature a terry cloth interior making for an extremely comfortable and absorbent foot bed. Each pair of socks is woven together from scratch, with your logo and design seamlessly weaved together to create a design that is uniquely yours! Great for marathons and races. Mid Calf comes in two sizes; standard and petite. Imprint Type: Knit-in Jacquard, woven tags or embroidery. 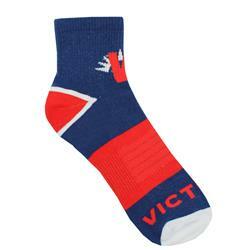 Imprint Locations: Anywhere on the body of the sock but we do not recommend detailed designs on the cuff. We cannot print on heel, toe or arch areas.